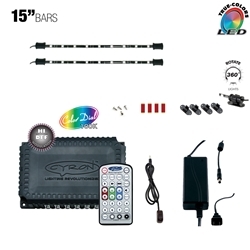 CYRON high definition commercial grade wireless multicolor LED lighting system with superior quality and ultimate control. HTP1502W1 utilizes the advanced HTW1012 infrared controller in a system that can cater to contractors and consumers alike. Feature packed with plenty of power to expand. Chose this kit as I thought it worked perfectly for my medium sized kitchen. Brings life to the entire kitchen and was worth the cost!